A U.S. trade judge recommended that some iPhones be barred from import on Tuesday after finding that Apple Inc. violated a patent held by Qualcomm Inc., handing the mobile-phone chip giant a victory in its long-running feud with its erstwhile business partner. The decision from the U.S. International Trade Commission judge means that Apple, which has its iPhones assembled overseas before sending them to the U.S. and other markets, could be barred from selling iPhones that infringe on a Qualcomm patent covering strategies for conserving power and improving battery life. The judge’s two-page order didn’t specify which iPhone models it covered. The decision by ITC administrative law judge MaryJoan McNamara, however, is subject to review by the full six-member ITC as well as by the Trump administration, either of which could change the findings and reverse the recommended ban. Presidents have vetoed ITC moves before, including in 2013 when the Obama administration prevented an ITC ban on the sale of some iPhones and iPads from taking effect after Samsung Electronics Co. won a case there. Qualcomm’s complaints against Apple—including another ITC case where a final decision was expected later Tuesday—are part of a world-spanning legal battle between the companies. The fight came to a boil in early 2017, when Apple sued Qualcomm in federal court in San Diego, alleging the chip maker extracted extortionate rates for patent licenses by leveraging its dominance in the modem-chip market. That case is set to go to trial next month. The U.S. Federal Trade Commission also filed suit against Qualcomm in 2017, focusing on the chip company’s allegedly monopolistic practices. Qualcomm, which denies the claims and says its pricing practices are fair, has countered by alleging that Apple violated its patents in Germany, China, the U.S. and other jurisdictions. In a separate case brought by Qualcomm, a jury in San Diego this month found that Apple violated the same Qualcomm patent that the ITC found issue with in the case set for a decision later Tuesday. The jury awarded Qualcomm $31 million in damages for Apple’s violation of three patents in that case. Analysts were left with more questions than answers about Apple’s new services that were unveiled at a press event. “Apple’s services reveal was materially different than we had anticipated,” said Goldman Sachs analyst Rod Hall. “With small calculated impacts from these, ‘other services’, we expect the focus to return to the slowing iPhone business post this event,” Hall said. Apple ’s extravagant unveiling on Monday of AppleTV+, its new video content streaming service, unveiled very little. Celebrities talked about their must-see shows without showing any clips. Apple executives trumpeted their plan to offer a bundle of content from different content partners without offering any details on pricing. So what to make of this newest entrant into the fiercely competitive and crowded streaming race? Apple’s service will offer original shows in addition to content from companies like HBO, Starz, and Showtime. In that respect, it looks a lot like what consumers get on Amazon Prime—a mix of original and partnered content—curated by a tech company that has decided to maximize its current business by leveraging mass desire for incessant entertainment. For Amazon Prime members, however, viewing is free; Apple’s service almost certainly won’t be. And does it make sense for the iPhone maker to be getting into content anyway? The company first put out its streaming box in 2007, but it has never commanded much market share. (Around 13% of connected TV users use the Apple box, according to eMarketer). The new service is mostly a way to draw more revenue out of Apple’s existing users. That said, Apple is going to be writing big checks. The main point of its glitzy event seemed to be to showoff the talent it already has signed: names like Steven Spielberg, Oprah, Reese Witherspoon, Jennifer Aniston, M. Night Shyamalan and J.J. Abrams. If Netflix investors were worried, however, they didn’t show it. At the end of the big day, Apple shares were down 1.21% and Netflix’s were up 1.45%. Beneath all the glitz and fanfare, that may be the core takeaway: Apple is late to the game, and Netflix has an enormous lead. The newcomer also will be competing against media stalwarts such as Disney , Hulu and CBS. Consumers opt in and out of services with a few clicks, tuning in for a show on one service only to drop it after a few weeks in favor of another. Walmart plans to launch an Android tablet designed to compete with the cheapest iPad model, according to a new report. The sources claim Walmart’s tablet will be ‘kid-friendly’ and sold under the retailer’s ONN store brand. The company has confirmed plans to offer this tablet, but didn’t provide any official details about it, such as price and launch date. Walmart already offers a number of electronics under its ONN brand, though they are primarily accessories like headphones. The company reportedly plans to focus on electronics and home items over the following year, at least according to alleged senior management presentations leaked by Bloomberg. Among its alleged tablet plans is said to be a model designed for — or at least capable of being used by — kids. This model will supposedly undercut Apple’s cheapest iPad model, which is currently priced at $329 USD. It’s unclear whether the model will offer anything special as an attractive lure from Apple’s 9.7-inch slate. It’s unclear whether Walmart’s kid-friendly tablet will target older kids or come with the same protection features and parental controls as the Amazon Kindle Fire Kids Edition. Yesterday the Supreme Court held a hearing in the case Apple Inc. v. Pepper. “Pepper” is Robert Pepper, an Apple customer who, along with three other plaintiffs, filed a class action lawsuit alleging that App Store customers have been overcharged for iOS apps, thanks to Apple’s 30% commission that Pepper alleges derives from Apple’s monopolistic control of the App Store. In my estimation, these three points move from less certain to more certain, and from less important to more important. In other words, whatever the Supreme Court decides matters less than what the very existence of this case says about the state of Apple and its future. The question before the Supreme Court is whether or not Pepper et al. have standing to sue Apple for antitrust violations at all; in other words, the case — which was launched in 2011 — hasn’t even started yet. The Clayton Antitrust Act of 1914 stated that “any person who shall be injured in his business or property by reasons of anything forbidden in the antitrust laws” can bring an antitrust action, but in the 1977 case Illinois Brick Co. v. Illinois, the Supreme Court held that only direct purchasers of illegally priced goods had standing to sue. The specifics of the Illinois Brick case are helpful in parsing out what makes the Apple case complex; specifically, the Illinois Brick value chain was very straightforward: concrete block makers (including the eponymous Illinois Brick Company) were accused of colluding to fix prices for concrete blocks, which were bought by masonry contractors; masonry contractors in turn submitted bids to general contractors for construction projects, which were ultimately paid for by the State of Illinois. The State of Illinois sued for damages, alleging that the higher prices resulting from the price fixing had been passed through to the State of Illinois. In this value chain it is obvious who the direct purchasers were: masonry contractors; to the extent the State of Illinois suffered harm it was indirect pass-through harm. Thus, the Supreme Court ruled that the State of Illinois did not have standing; if every party in the value chain were to sue, the infringing party could be subject to duplicative recovery for damages (and parsing out the share of damages would be extremely difficult). Apple charges apps purchasers a 30% commission on each app sale (unless it is a free app). 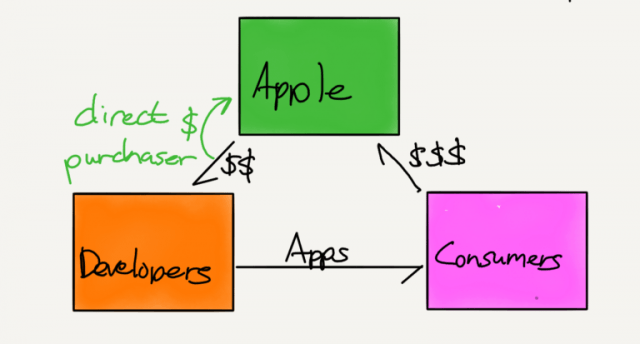 The price paid by purchasers for an app is the amount set by the apps developer, plus Apple’s own supra-competitive 30% markup, both of which are paid directly to Apple, the alleged monopolist, every time an app is purchased. Apple keeps the entire supra-competitive portion of the purchase price for itself and remits the balance to the apps developers. The apps developers do not sell their apps to iPhone customers or collect any payment from iPhone customers, and iPhone customers are the only purchasers in the entire chain of distribution. Since Illinois Brick was decided 40 years ago, courts throughout the nation have had no trouble applying its “direct purchaser” standing requirement to various factual settings, including cases in which some form of payment is made to an alleged monopolist prior to the monopolist’s sale of a product. Respondents suggest for the first time that Apple “has adopted the role of a retailer functionally buying from developers as wholesalers and selling to iPhone owners as consumers.” But their complaint does not allege that. And Respondents have repeatedly acknowledged that only consumers buy apps; Apple does not. The Apple developer agreements cited by Respondents confirm this: developers “do not give Apple any ownership interest in [their] [a]pplications.” So Apple is fundamentally unlike a traditional retail store. As Respondents note, [the Developer] Agreement confirms that “Apple acts as an agent for App Providers in providing the App Store and is not a party to the sales contract or user agreement between [the user] and the App Provider.” Thus, Respondents concede that the direct sale is actually between developers and consumers, facilitated by Apple as an agent and conduit. Along those lines, Apple argues that developers set the price of their apps, which determines Apple’s 30% cut, and to the extent developers set prices higher to compensate for that cut they are passing on alleged harm to consumers — which means consumers don’t have standing to sue. PG says there’s nothing more bracing in the morning than a bracing dose of antitrust law. It tones up the mind and prepares it for broad gauge analytical work in any field. Amazon is aggressively pursuing market share growth in mobile payments. WSJ reports that Amazon is asking gas stations and restaurants to offer Amazon Pay options to customers. Amazon also will be increasing the presence in brick and mortar stores with whom it does not directly compete for retail sales. On the other hand, Apple also is looking to gain a decisive market share for its own digital wallet platform. A recent Bloomberg report mentioned that Apple Pay is in second position, behind PayPal in number of active users using the digital wallet. However, Amazon has a significant benefit due to its online retail business, Prime membership and further growth in the brick and mortar space. Amazon also is investing heavily to increase the market share of Amazon Pay in international regions. As the mobile payments market matures, we should see two or three major players grabbing a big chunk of the market share. Amazon Pay has been around since 2007. However, Amazon has only recently started making aggressive investments to increase the market share of its digital wallet. It’s now asking brick and mortar stores with whom it does not compete to allow Amazon Pay options for customers. It’s not clear whether Amazon Pay will use QR codes or NFC technology which is used by Apple Pay. QR codes are generally preferred by smaller business owners as they can print and tape the codes without any big investments in NFC terminals.